I spend a fair amount of time researching sewing techniques online, particularly when I am trying to do something new. I love this about the sewing community - people are so generous with their knowledge! I'm adding a page to my blog with sewing resources so that if you are so inclined, you can have easy access to helpful tutorials. I'm sewing some bags this week and I'm putting zippered pockets in all of them. I want them to be attractive, because they will be on the outside of my new clutch, and on the reversible side of my MaiseyBelle bag. I really like this zippered pocket tutorial from Sew, Mama, Sew, because it allows the pocket fabric to peek out and become a design element. 1) Instead of drawing a rectangle for the zipper window (.5 inch x 7 in), I put a strip of 1/2 inch wide clear tape where I want the zipper window to go. I then sew around the tape and simply peel it off when I'm done. This saves time with drawing and I don't have to clean off the ink afterwards. And if I don't quite get it centered correctly, I just pick it up and move it. 2) I like to reinforce the pocket in some way so that it doesn't pull apart from the weight of keys, change, etc. You can reinforce the pocket fabric with interfacing and add an extra strip of interfacing where the zipper will go. If the fabric is quite strong (home dec or upholstery weight) I sometimes simply stitch around the pocket 2-3 times and then zig-zag or serge the edge. Reinforcing the pocket satisfies the same gene in me that makes me put more tape than is needed on a package before putting it in the mail (that little voice that says, "just in case . . ."). And it is a genetic trait, I'm sure. I used to curse (but only a little) my dad when he sent me packages when I lived abroad. It was impossible to open the d**n things without the use of several sharp tools. 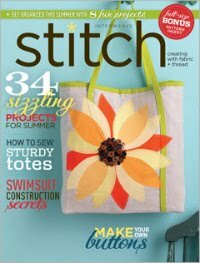 Once you get the hang of it you can add a zippered pocket to a bag lining or exterior in 20 minutes. And you can have it complement the bag, too!